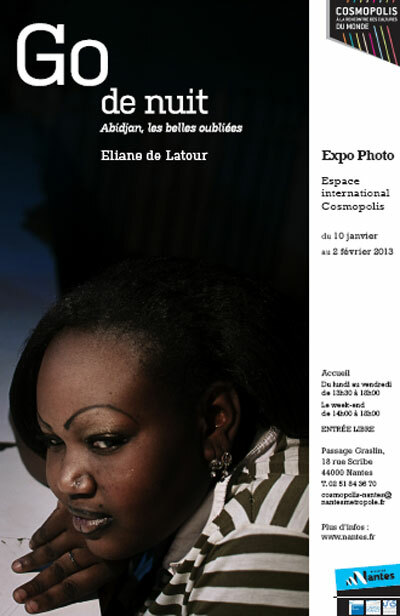 2013 starts with a sad event in Paris' African American community. We lost our dear friend, Mr. Benny Luke. Some of you may know him as 'Jacob' in all three parts of the classic French comedy 'La Cage Aux Folles' (The Birdcage). Others may have seen his cabaret shows, or if really lucky, you saw him dancing on stage with no other than Miss Josephine Baker. 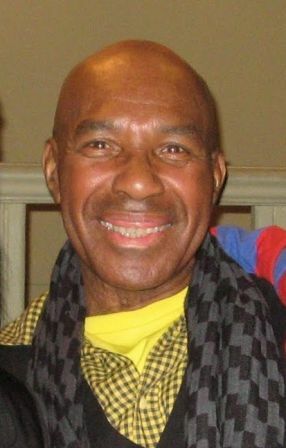 Benny brought much joy and hilarious laughter to the Paris community. Whether as the bar manager at the famous Haynes Soul Food restaurant, or later as the gracious host of his own 'Bojangles' club/restaurant a little further in the 9th arrondissement. 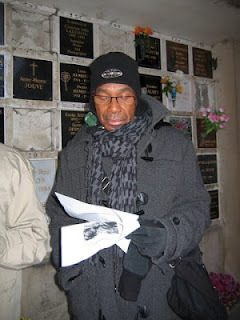 Benny at the Richard Wright 50th anniversary memorial, Père Lachaise cemetery. Among many fine memories I have of Benny, the last was the most touching. At the beginning of my month long sojourn in Paris last spring, Benny mustered the strength, though he was not doing well at all, to make his way from the suburbs to come have a bite and welcome this rolling stone back home. Our three France-based contributors have stepped out of the box to revive their winter souls: Normandy, Controversial Art, Questionable Films. You'll find each full bio at the end of this post. Sometimes You Gotta Leave Paris to Love Paris. Paris is starting to turn into a routine for me. I have a lot of homework every night; I am staying up too late skyping my boyfriend; I am missing my family and friends back at home, and I am going to the same places everyday around the city. I am not getting enough exercise so I consistently feel tired and heavy. Friday morning, feeling groggy and sad, I rush to the meeting place for our excursion to Brittany and Normandy. I thankfully get there early and find a spot in the back of the bus where I can lay down to sleep. Reunited with students from my school that I haven’t seen for a while (because of our respective busy schedules), I have a chance to catch up a bit. We began to leave Paris and about thirty minutes into the ride, I comfortably fall asleep. Waking up a couple times during the bus ride, I catch a glimpse of beautiful rows of corn and other crop and roaming sheep, horses, and cows. The beautiful views will continue throughout the week-end-long trip. Two particularly amazing parts of the trip are the visit to Mont Saint Michel as well as the visit to the landing beaches in Normandy. 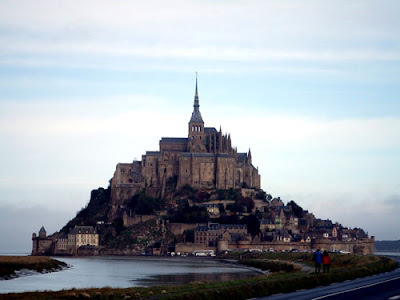 The abbey on Mont Saint Michel is incredibly beautiful and had a general peacefulness about it. Breathing on the top of the hill is like inhaling the cleanest, kindest air possible. Legend has it that archangel Michael asked for the church and abbey to be built on that specific hill. It is a place full of legend and tranquilities. Then going to the landing beaches is also peaceful but in a very different way. 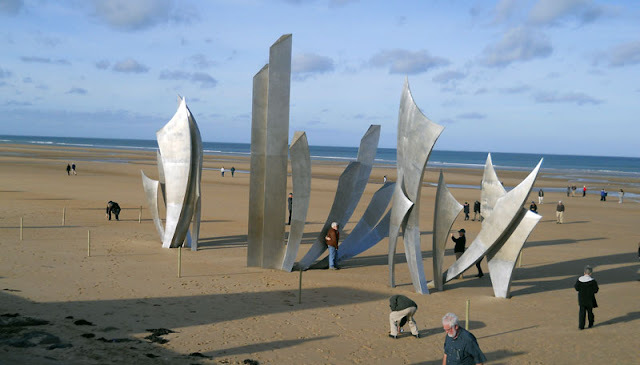 We visit Omaha beach which was one of the bloodiest of the landings, where millions of soldiers fought against the Nazis. The beach is clean and beautiful. Several feet above it on a hill is a huge cemetery honoring the soldiers who died there. It makes me think about more important things in life, and what it means to give your life for a cause. On the way home I feel so much more willing to face Paris, and experience it in a more positive way. 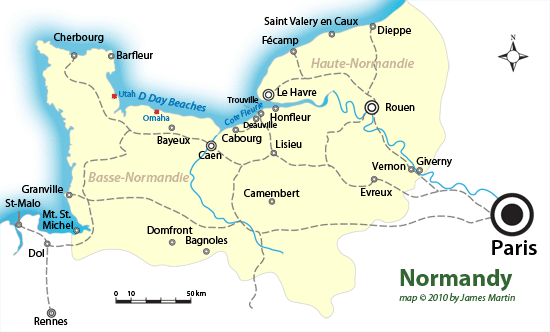 I decided that I will definitely go to several different French towns and provinces through out this trip. January 10th was a special day for me. First it was my mom’s birthday and she’s 66 now. After a lunch celebration with family, I went to Back Slash Gallery (www.backslashgallery.com) in the third district. The event was the exhibit of “Negus In Paris” by Fahamu Pecou (http://www.fahamupecouart.com). I had the information from several friends from Atlanta. Mister Pecou lives in Atlanta and his Parisian exhibition is from January 10th to February 23rd 2013. Inspired by the Jay-Z and Kanye West song “Niggas in Paris”, Negus is an Amharic word from Ethiopia who describes the royalty in general. Fahamu Pecou’s wordplay describes and shows the contribution of African Americans in Paris. 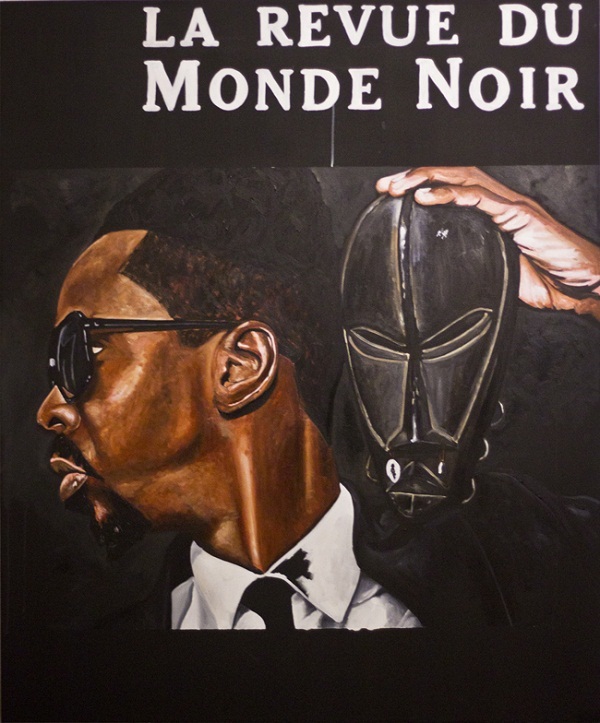 In his paintings you can see him surrounded by people as James Baldwin, Nina Simone or Josephine Baker. It’s an interesting journey in Fahamu Pecou’s work. 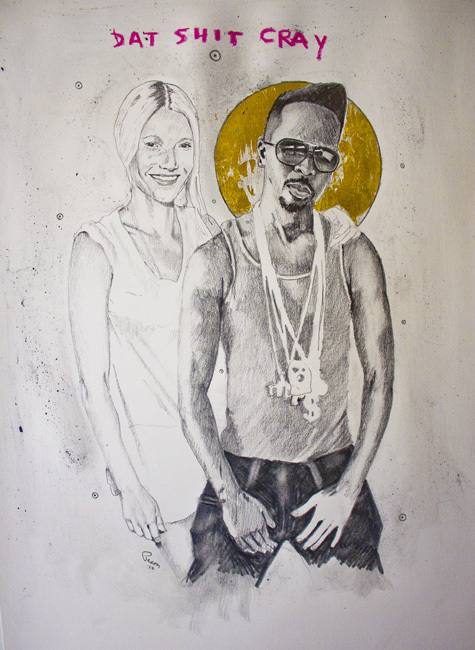 Fahamu Pecou, Negus in Paris, for real (featuring Gwyneth Paltrow), 2012, Graphite, gold leaf and oil stick on paper. French Colonial Romanticism or Not? This week-end I went to go see the documentary entitled “Comptes et décomptes de la cour” of a photographer and film-maker named Eliane de Latour. A very simple, straightforward and non-glamorous testimony of five wives married to the same man who, upon becoming nominated Chief of his village, is obligated to lock his five wives away due to tradition. The first four wives, before their “religious” imprisonment, lived in the city and were free to come and go as they pleased. Three of these wives were successful business women who traveled far and wide to purchase and sell their goods. The fourth wife is a nurse and thus accustomed to interacting with people all day long. Once locked away, the three business-oriented wives established a system so as to be able to continue earning money from commerce, using intermediaries to purchase and sell the goods. The nurse wife sneaks away to the village clinic to exercise her profession, never allowed to return home. Then along comes the fifth wife, young and despised by the other four, so much so that the husband takes her away from the harem and sets her up in a house somewhere else. The documentary puts forward the assumption that the last wife does nothing all day but put on make-up and wait for her husband, who has eyes only for her and totally neglects the four others who are locked away. These beautiful women who feel old and ugly and unwanted and jealous because one man does not respect one of the matrimonial foundations of his religion, that of marrying more than one woman only if you can take care of, and satisfy all of, them equally. As one wife said so deliciously (I’m paraphrasing), these types of husbands will be flogged once they have passed on to the other side and are being judged by Allah, so why not start now, here on Earth? Why wait until they are dead to judge their wrongs deeds? My question was, once the film was over and Eliane de Latour was explaining her work and the economic importance of these women for their husband and household, why do some people like to steer the attention towards how important women are who are suffering greatly, and that we should not overlook their contributions, nor forget their immense capacity to turn adversity into benefit. Hasn’t that been what those who write our Western history always do? Judeo-Christian manipulation of the social psyche. What woman, deep down inside, doesn’t know her plight and what she contributes to society and her unlimited capacity to forge on no matter what patriarchal society throws at us? Isn’t it more important to ask, how are we going to change all of this? Something about the presentation of the documentary felt like French, colonial romanticism. What would the documentary have been like if the film-maker had given the camera to the wives, showed them how to use it and let them direct the film? What vision would they have presented to us? What questions would they have asked? How would they choose to represent themselves? And these questions pertain to so many......when will history be re-written by those who “have not” instead of those who “have”? Luna Vincent White was born in Chicago and when she was eight she moved to Los Angeles so that her mom could pursue her dreams of writing for television. Luna goes to the University of Southern California, studying a combination of history and sociology to look at racism (hopefully) with a minor in cinematic arts as well as French. She is also studying film because eventually she wants to become a director, whose films encourage empathy and cultural understanding. Luna has always loved traveling, and because she moved so much through out her life, she has grown used to the feeling of changing locations a lot. She was so excited to travel to Paris and has taken French since high school. Her hope is to become fluent and perhaps understand a bit of how racial prejudice and xenophobia play a part in Parisian life. Epée Hervé Dingong is a freelance writer from Paris, of Cameroonian origin. He graduated from the prestigious C.F.P.J.journalism school in Paris. During his time as a staff writer and freelancer he interviewed a lot of Hip Hop and R&B artists from US, France, Holland, UK and Germany. His work appeared in different print publications such as Radikal magazine, Tracklist, The Source France, Musique Info Hebdo, Lady Caprice magazine, Juice Magazine, to name a few. He has collaborated with American print magazines and online publications such as The Source magazine, The Ave Magazine, Mugshot Magazine, www.daveyd.com, www.euromight.com and www.thestarklife.com. He writes about music, politics and social issues. 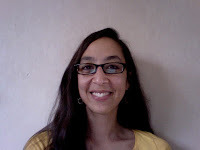 Anna-Karina Caudevilla is a native from Washington DC currently living in Nantes, France (north-west coast). A long time traveler, insatiable learner, Jane-of-all-trades and militant believer in living life creatively, she has set up roots in the United States, Spain and France. Anna-Karina is currently finishing a Masters in Art and Cultural Management in Nantes which led her to discover The Shackles of Memory Association – Resource & Study Centre for the Study of the Slave Trade, for whom she is now an active member.